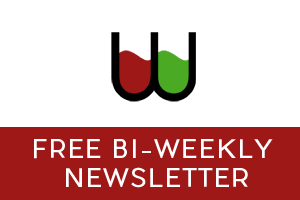 There are some producers – not very many – whose sudden absence would leave an irreparable hole in the fabric of the South African wine industry, so unique and valuable are they. Craig and Carla Hawkins have over the last decade or so built Testalonga into such a producer, one that brings real integrity into the mix too. Fortunately, a sudden absence is not looking likely. 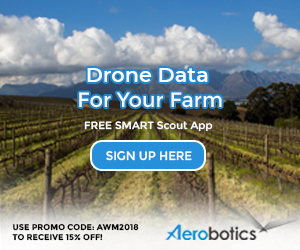 They now are definitively establishing their own farm-base in the northern Swartland, and are clearly successful with their comparatively small volumes, exporting to 29 different countries, mostly in Europe, with the UK and Japan the largest individual markets. So, restaurants and wine-bars specialising in “natural” wines around the world are where you’ll find them, cool young sommeliers probably their most passionate promoters. Scarcely corresponding to the smallish volumes is a large range: they offered 14 wines at a Cape Town tasting of their 2018 vintage earlier this week, and they make three or four more for specific foreign clients. There are only tiny quantities available for the local market (especially small given the difficult vintage): for example, just 24 bottles – for the whole of South Africa! – of El Bandito Mangaliza, the hárslevelű that I enjoyed extremely. 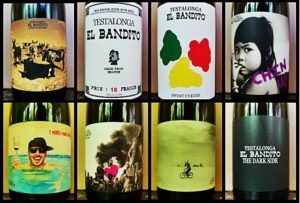 Some of their chenins, though, are in rather larger quantities – up to 600 bottles of the Baby Bandito Keep on Punching and 300 of Baby Bandito Stay Brave. 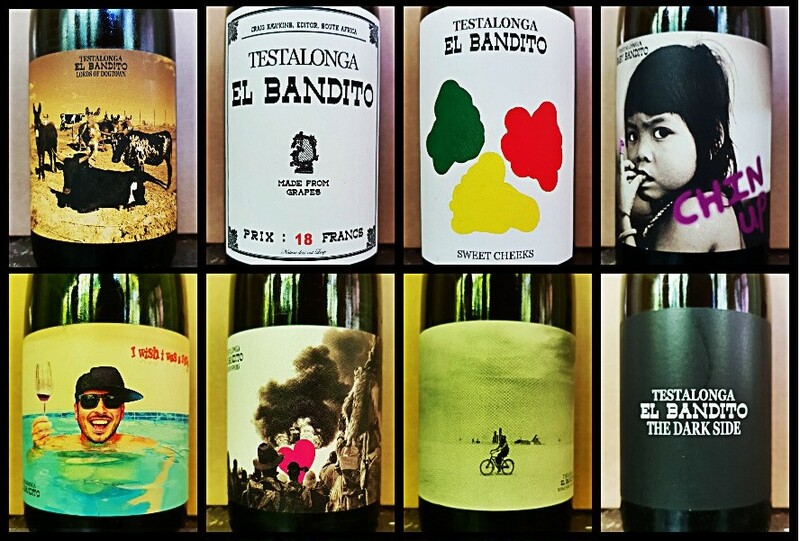 The Baby Bandito range should retail at about R150 if you manage to find them, incidentally, about half the price of most of the El Bandito wines. You’ll note, if you didn’t know it already, that the names are extravagant, and arguably self-indulgent, something which doesn’t usually appeal to me – but these so clearly emerge from the deeply committed and personal relationship of Craig to his wines, so integrated with the bright and brilliantly eccentric labels that he designs for them, that they avoid cuteness and, well, I manage to relax and just enjoy them too. All the wines are genuinely “natural” in that not only are they made with minimal intervention (low sulphuring on most, sometimes a coarse filtration – they are clear and bright, in appearance not at all parading any funkiness), but they are all made from organically grown grapes, which is something a great deal less common in the Cape new wave than is winemaking restraint. Craig works to this organic end with the mostly Paardeberg, Swartland farmers who supply them. So, with this enthusiasm of mine for the Testalonga project, what of the 2018 wines? They’re from single soils and single varieties. Two general, entwined characteristics must be mentioned (both frequently found in “natural wines” but by no means necessarily so – witness the wines of Reyneke, with no fewer “natural” credentials): the high acidity and low alcohol that come from what is, by usual standards, early harvesting of the grapes. Undoubtedly the bright acidity adds great freshness to the wine, enhancing their more-ish, mouthwatering compatability with food. Craig wants his wines to be “razor sharp”, and they are – some drinkers will find themselves smarting from cuts, it must be said. The low alcohol? Well, it is also part of the freshness, I suppose, and does allow one to drink that bit more. An unequivocally positive characteristic is the bone-dryness of the wines (except for the two petillant naturels, which have sweetness, and are the wines in the lineup with the least appeal to me – it’s a greatly overrated category anyway). Another vital one is the universal purity of flavour and character, including in the skin-contact, “orange” wines, of which there are three or four. I did ask Craig if his early picking was done primarily for the sake of the low alcohol or the acidity, and his response was, essentially, that he picks on the flavour and character (including acidity) of the grapes; the alcohol level is a simple consequence of that. And in fact it is that lowness of alcohol that disturbs me in a few of the Testalonga wines, as it does in some other producers’ wines of similar character. I find it can lead to something like insipidity, a too reduced vinosity and volume. As a general but not inviolable rule, once a wine dips much below about 11.5% ABV, certainly 11%, its vinous balance is getting perilously affected (except for the light sweet rieslings of Germany). But that’s just to express a personal desideratum. For example, we tasted together two Baby Bandito reds from lighter, simpler varieties. Chin up, a cinsaut, has a light, savoury-fruity charm, easy but not trivial, and with just enough substance to compensate for its 10.8% alcohol. Follow Your Dreams, from carignan, has nearly an added percent of alcohol and to me worked even better as a delicious whole – textured, poised and balanced. There are too many wines, though, for me to comment on them all. It was a challenging vintage, especially for the reds, but Craig and Carla have built their understanding of what they want and how they get there, and their achievement with both reds and whites is undoubted. The piercing acidity and lack of fruitiness does mean that they’re not for all wine-lovers, however. For the converted, though, it’s a range of wines of great integrity and conviction, without a dud, and to be explored – if you can find them. thats some dry tasting ability Keith?